Need a healthy treat for the weekend? Do you love sweets, but not the excess sugar, fat and additives? Do you want to enjoy chocolate without guilt? If you answered yes to one of those questions, raw chocolate is the way to go. Cacao is the raw, unprocessed form of chocolate. These untreated seeds referred to as cacao beans can be considered a superfood offering a wealth of antioxidants and essential vitamins and minerals. The cacao beans are grown on small tropical trees named Theobroma cacao, which literally translates to “cacao, the food of the gods” in the Greek language. These trees are native to Central and South America. Today Western Africa produces around 60% of the world's cacao. The pods are harvested throughout the year, because not all pods ripen at once. 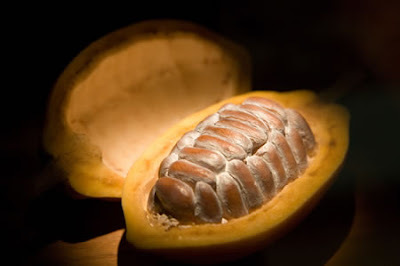 Each cacao pod that emerges from the tree typically houses between 40 and 60 cacao seeds. After careful harvesting, the pods are opened (and the peels discarded), the seeds are removed, and they undergo a natural fermentation and drying process (preferably by the sun). The fermentation and drying process takes several days, and the bitter cacao seed is transformed into a sweet, mild cacao bean. The cacao bean consists of 54% fat or Cacao butter (Heart-healthy fats: Oleic acid, Stearic acid and Palmic acid), 31% Carbohydrates (high in fiber), 11% Protein (arginine, glutamine, leucine), 3% polyphenols=antioxidants (flavanols, proanthocyanins) and <1% minerals (iron, magnesium, copper...), vitamins: B1, B2, B3, B5, B9, E.
Raw cacao beans are then roasted to form cocoa, ground and mixed with sugar and fats to make chocolate. The high heat during the roasting process reduces the levels of antioxidants in the cacao, minimizing the powerful health benefits found in the unprocessed, raw cacao. To receive the greatest benefits from cacao, look for "raw" (non-roasted) cacao beans. Chocolate contains an antioxidant called flavanol and it’s this little component that could potentially have health benefits such as lowering blood pressure and improving circulation, lowering LDL cholesterol, neutralizing free radicals, improving digestion and enhancing mental well-being by improving mood and fighting depression. As flavanol and the vitamins are contained in the cocoa itself, you should obviously choose a chocolate bar with a high cocoa solid content, specifically dark chocolate. Dark chocolate generally has a much higher cocoa content than milk chocolate and the milk itself will dilute the effects of the flavanols. As white chocolate often doesn’t contain any actual cocoa, this won’t have any effect on your health. Basically, dark chocolate has the most amount of cocoa solids and therefore the most actual ‘chocolate’ in it. The higher the cocoa solids in a bar of chocolate, the better the quality and, if you like your chocolate authentic, you should be looking at choosing something with at least 70% cocoa content. You also know that if there’s plenty of cocoa in there, there isn’t going to room for much else. Dark chocolate doesn’t have any milk or milk powder in it either so you get more of a true chocolate flavour. However, this isn’t to everyone’s taste, as it can be quite bitter. Also, you need to remember that if the cocoa solids are high then there’s going to be less sugar, which will again make the chocolate taste bitter. A BBC report indicated that melting chocolate in one's mouth produced an increase in brain activity and heart rate that was more intense than that associated with passionate kissing, and also lasted four times as long after the activity had ended. "The study also found that as the chocolate started melting, all regions of the brain received a boost far more intense and longer lasting than the excitement seen with kissing." Click here for the full article! Now, before you empty your fridge of veggies and fruits and replace them with chocolate bars, bare in mind that chocolate is high in calories and should be eaten in moderation. Stick to my 90%/10% rule and you'll be just fine. That means, eat 90% clean and you'll get to "cheat" 10% of the time. If you eat 5 meals a day 7 days a week, you get to endulge up to 3-4 times per week. Here's my post on cheat meals. Vitamin D - sunshine in a bottle?